Okay, I am asking for help again. I would like you to answer some questions for me. 1. Do you enjoy reading mysteries? 3. 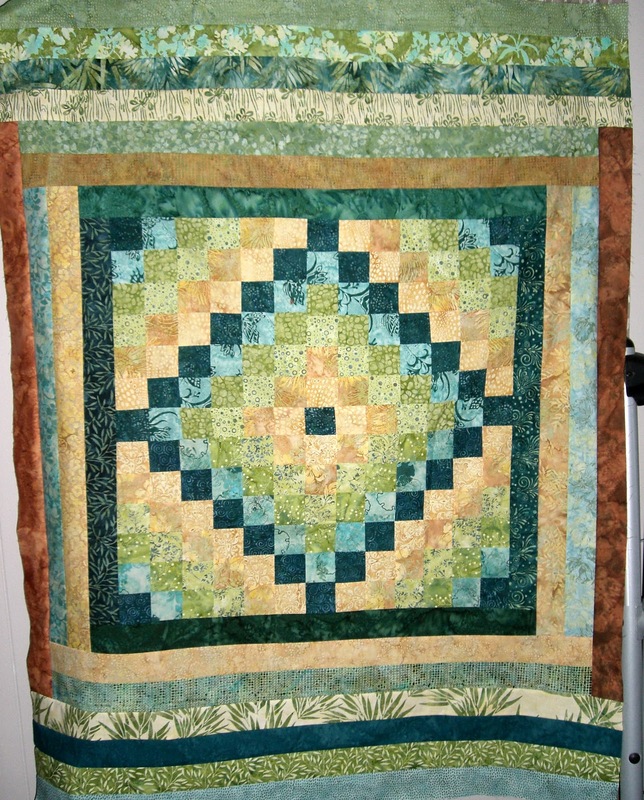 What do you call a quilt block that looks like this? I am looking for the block name or names - I want more than one. 4. Do you like giveaways? And you are wondering (aren't you? ); why am I asking these questions? Here it is the teaser!!!! I am working on two things - one of them will be a giveaway. The other is a project that I can't tell you about yet. I finally got back to working on the scarves just a bit. These take a bit more time than I had realized. The first two were total play time so I didn't pay much attention. The good part is that I need to be mildly distracted when I do it, so I put a comedy show on the television because laughter is good for the soul and in my case, the muse too. Thus the time is not all "work" and I don't feel bad about spending extra time on them. What I found is that if I am not distracted, I obsess on details/perfection and it just doesn't work for me. These are supposed to be loose casual designs. They should be soft and playful designs on the elegant silk. Or at least that is what *I* want to make out of them. So, without further ado---here are the latest two scarves. The previous two that I did are in this post. All of the scarves are 8" by 54". I tried to do one in just purple and green but it didn't work. The purple and green I have ended up blending into a tragic mess. Adding some teal and a touch of yellow solved the problem. Oh yes, since I photographed these on a black background, I had to overlap the one on the right to show that the ends of the scarf are black also. Which one do you like best and why? Your thoughts may help to inspire me on the next ones I do. 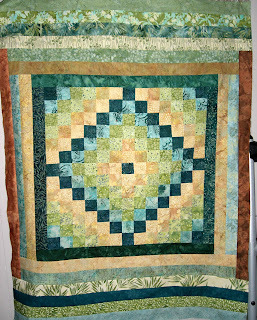 The TRIP AROUND THE WORLD quilt is quilted. It just needs binding. But today I have worked enough. It is time to play and relax. A cup of tea sounds good. You may have noticed I am not blogging quite as often. I have lots going on. Nothing bad, just busy. I did manage to finish binding layer cake quilt. All finished and ready to sell. 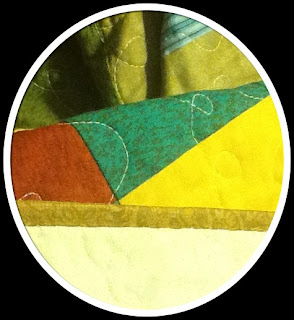 I also added a POP of bright to the 'Round the World quilt. I had not considered (auditioned) this yellow, but I was determined to finish without buying more. Yaay, I did it. 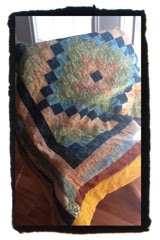 This made it a nice size for a lap quilt, however, I put the flimsy on a cubicle wall to take another look at it. It will make an excellent wall quilt too. Whoever buys it when it is finished gets to decide. I found it in the UFO pile and decided it needed to be finished. So I used all the rest of the strips and surrounded it. ignore the exercise equipment to the right of the quilt. I do! It isn't as large as I would like, but I don't have anything that looks good with it. (and I did a lot of auditioning - that is half the work!) I just can't purchase for any more fabric at this time. So, I will back it, quilt it, bind it and hope someone loves it enough to buy it. It would look great on a wall. What do these tools mean? They mean that I am actually sewing the binding to the back of a quilt by hand. I learned the value of a thimble in the process. You will notice there are two in the first photo. The metal one fits my finger best and works best for me. My reading indicates that thimbles are a very personal choice. Do you use a thimble? What kind is it? Some of you have noticed that I have been a bit quiet. That means that I am either really busy OR working on something that doesn't show a lot of progress. Or in this case, not having time to make any progress. I have been very busy with work and with caregiving for Mom. I also wrote some copy for a friend who is working on a brochure to promote her work. Imagine my surprise when I saw that below my comment was a comment from Cindy at Riley Blake asking all the above (first 20) commenters to send in a mailing address for a prize. Thinking, well it may be too late, but no harm trying, I emailed them. Good thing too, look at this lovely rolie polie (2.5" strips of fabric) that came in a lovely squishy envelope. The fabric is Fox Trails by Doohickey Designs I love the little animals on it. What really surprised me was the post on Doohickey Designs dated September 9th. She had just gotten her first rolie polie of Fox Trails. I got it less than a week after the designer!!! I think this is a first for me. I don't usually get fabric that has just been released. Now to decide what to make with this sweet little roll of goodness. I just had to open it up a bit to show you the cute animals. Isn't the little fox adorable? Since I needed some extra items for the sale in November, I ordered some silk scarves. These come in a cream or an off-white color. But of course when I get through with them they are bright and colorful. Check out these - they are my first try with this technique. Mmmmm... I like it. What do you think about them? Oh yes, what would be a reasonable price for them? Today I did some more fabric dyeing. But I had bought a few polos on clearance (aka really cheap!) and one of them was white. It isn't white anymore. Funny thing though, the thread it was sewn with is still stark white. It didn't take the dye at all. The next pieces looked very interesting before they were washed. But afterward, they lost a lot of intensity. You are seeing the back of the blue fabric that was overdyed because the front just looks "dirty." However, the back will make a nice neutral to put against a bright color to really make it pop. The one below was also wonderful and vivid before it was washed...but now is kind of pastel. I am sure I will find a use for it. The this one is another piece of the blue fabric that was overdyed. Again, this is the back. I think the front was printed with something that resisted retaining the dye. The back is lovely, I think. Finally, this one looks almost as good after washing as it did wet. The shibori lines show nicely and the color is good. I can tell that I need to invest in some fiber reactive/procion dyes if I want to get intense colors. Or better yet, I have a birthday at the end of this month if anyone wants to send me some procion dyes. (ha ha) I already have the soda ash that is used as a fixative; I use it for making laundry detergent. I pretty much wrecked the shirt. I kept trying to find think of a way to salvage it. Sunday morning really early, before getting out of bed, I just got it in my head. So it was on my agenda for play time. I made a pattern out of rice paper (it was handy, the tracing paper wasn't.) I cut out a piece of fabric (batik - are you surprised?) and went to work on it. Now I know that bottom edge looks wonky in the photo, but it isn't. It is just that it didn't hang straight. I also had another pre-dawn idea to work on a digitizing project that I have been playing with. That didn't work out -yet. But I discovered another thing in my free digitizing program. So I designed this star. First I sewed it out on just plain stabilizer. Then I made some edits and sewed it out on some fabric, using a better grade of embroidery thread. My stitches are a bit too dense so I got some wrinkling on the right and lower parts. However, I think will still be able to use it. And for those that are in the USA and Canada - Happy Labor/Labour Day! Today I had a friend do some prep for a form of shibori fabric dyeing for me. This particular method can be extremely planned or you could have your helper do it randomly. Or you could do it yourself if you have to. Marbles were individually placed under the fabric and then secured with rubber bands over the top. The rubber bands need to be pretty tight. After all the marbles are rubber banded it is time to dye the fabric. I use Rit dye and a low water immersion method. I used two colors of dye in separate containers that were side by side. I did drizzle some from the burgundy side into the purple side. After the fabric was rinsed (several times) the marbles and rubber bands were removed. Then, I took it outside and hung it on my chain link fence. 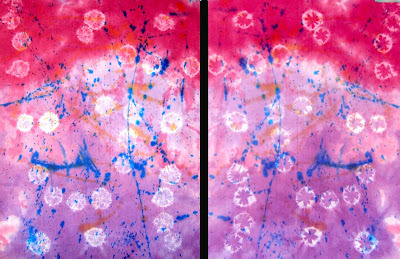 Some textile medium, acrylic paint (golden liquid artist acrylics) and water were blended together and flung/spattered on the still wet fabric. Then I left it to dry. After drying, I brought it in and ironed it to heat set the paints. This shows both sides so that you can see the difference in the areas where the marbles were. On the side touching the marbles, it resisted the dye. On the side away from the marbles it died the centers. The random edges of those shapes are caused by the bunched fabric held tightly by the rubber bands. I am still surprised that I haven't made a mess with the dye. I think I will buy a few more colors to play with since I have been so careful with it. Read all of this please! The second thing is on down the page. Today I found out that September is National Preparedness month. Since I work in emergency preparedness, I had to share that with you. Are you ready for an emergency or a disaster? No? 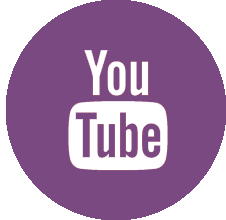 I consider you my friends so I am offering these links to places that tell you some things to do to prepare. http://www.ready.gov/ -tells you how to make a kit, plan and be informed. She challenged us to write a letter or card to the ones who gave us a love of sewing/quilting. For me that would be my Grandmothers who are both gone. 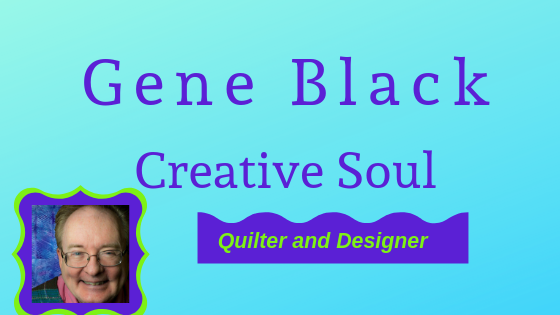 However, my blog readers and other bloggers continue to inspire me and feed my love of quilting and sewing. So I am writing this "card" to say Thank YOU! You are an inspiration to me. Those of you who comment frequently help me to find clarity or else inspire me to try something different. So I say "Thanks to you all, I really do appreciate you."